WARWICK, R.I. — The latest hearings for the fossil-fuel power plant proposed for the woods of Burrillville allowed the Energy Facility Siting Board (EFSB) and intervenors in the project, such as the town of Burrillville, to cross-examine expert witnesses about the project's central controversies. 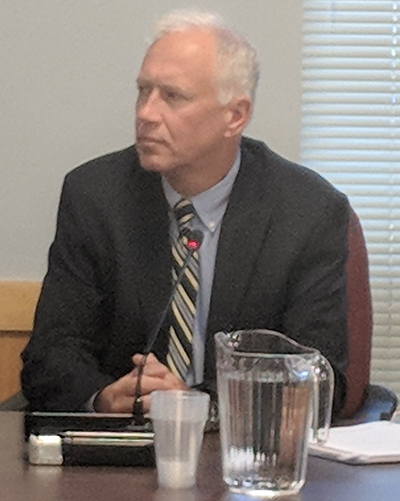 Burrillville attorney Michael McElroy initiated the questioning by asking EFSB chairwoman Margaret Curran to disqualify Invenergy’s engineering witness, Mark Wiitanen, for lacking expertise about noise, stormwater, and air pollution. Curran denied the request without explanation. During questioning, McElroy noted that Wiitanen doesn't have an engineering license in Rhode Island and that he has never testified against a proposed power plant. Wiitanen and his engineering firm, HDR Inc. of Omaha, Neb., is the “owner’s engineer” for several of Invenergy’s natural-gas and wind turbine projects, according to McElroy. McElroy and EFSB members inquired about the water needed to cool the power plant, especially when it runs on diesel fuel during times when natural-gas supplies are restricted. Wiitanen said water use could increase from 16,000 gallons per day to 800,000. He insisted that such use wasn't likely to last more than a few hours over the course of a few days. But McElroy and EFSB member Janet Coit wanted to know what happens if diesel use eclipsed the 15 days a year that Invenergy has estimated the plant would need to use the dirtier fossil fuel. Wiitanen testified that the plant would likely continue to operate if its diesel electricity was called upon by the regional grid operator. The line of questioning bought up concerns about increased water and fuel-truck traffic on Burrillville’s narrow roads. Project opponents held signs during the recent Rhode Island Energy Facilities Siting Board meeting. McElroy asked Wiitanen about the release of air pollutants from the proposed energy facility, such particulates, volatile organic compounds, and carbon monoxide. “And you have no problem having your children breathe it?” McElroy asked. The design of so-called "fast-start" natural-gas power plants that recycle cooling water is the latest generation of energy facilities, Wiitanen said. Several are being proposed and built across the country, but only one, a 1,480-megawatt three-unit power plant in Jessup, Penn., is on-line. But only one of its three units is in operation. Wiitanen touched on a central sticking point in the power-plant debate: the actual need for the facility. The fossil-fuel industry, power-plant developers, and natural-gas infrastructure advocates claim new natural-gas power plants are the bridge to a broader adoption of renewable energy. But the lifespan of this alleged bridge is unclear. Wiitanen noted that the new model of natural-gas power plants, such as the Clear River Energy Center, can operate for up to 50 years. The proposed Burrillville facility would become Rhode Island’s biggest emitter of carbon dioxide and could be in operation well beyond 2050, when some climate modeling suggests that the planet should be free of fossil-fuel emissions. Wiitanen also said the Clear River Energy Center would be challenged to meet the 43-decibel noise limit set by the town. The final series of hearings for the proposed Burrillville power plant continued with a few changes. Meredith Brady filled the open seat on the siting board. Meredith Brady took over the empty seat on the three-member EFSB that was vacated when Paraq Agrawal resigned as the associate director for the Division of Planning. Brady joined the Division of Planning after seven years at the Department of Transportation, where she was the administrator of planning. She promised to get caught up on thousands of pages of testimony, plans, advisory opinions, and other documents compiled since the $1 billion project was announced three years ago. Brady will also serve on the Executive Climate Change Coordinating Council (EC4). “She has a stellar reputation,” said Coit, who is chair of the EC4 and the director of the Rhode Island Department of Environmental Management. The three-member EFSB must approve or deny the nearly 1,000-megawatt Clear River Energy Center based on whether the dual power plant energy facility is needed to meet state and regional energy needs; improves the socioeconomic status of the state; is cost justified; and whether the environmental harm is acceptable. Media access to the proceeding was reduced without notice. An EFSB staffer said the change was made at the request of Invenergy, to make room for paperwork. A metal bookshelf was placed in an area that was previously used by the media for photography and video. The hearings are scheduled to continue July 24 and 25, when expert witnesses on employment and property values will be cross-examined. The hearings will be held sporadically through Oct. 31. A decision by the EFBS is expected by the end of the year or in early January. Appeals of the decision are expected.